Our family meal plan comes together when I write it down on purpose, on paper. With that being said, there are so many times where crazy, busy life schedules get in the way and that is when my Power Cooking strategy comes into play. This weekend at my Becoming Conference, I shared ideas for saving money on food, without using coupons. Of course, one of the largest ways I slash our grocery budget it by pairing coupons with all my grocery guru strategies, but for many consumers, strategically using coupons on a regular basis is not a reality. Isn’t it great to know there are so many other options for saving money on food? Another tip I shared at the conference was how to save time when buying meats in bulk. When buying in bulk, our tendency is to stick four pounds of chicken breast in the freezer right away, but that just leads to dinner dilemmas later on. Read here to see how I prepped 30 pounds of chicken in a short amount of time. Yes, chicken meals in minutes. So let’s get inspired and enjoy having our families around the dinner table again. Great post Jen! Im starting to plan ahead for the fall chaos of sports and this helped inspire me! How do people live without a crock pot? I am loving your site!! I am so excited to find others that enjoy the things I do… thrifting, garage sales, couponing, DIY, trash to treasure etc. I do it mostly to save money but I really get a thrill out of treasure hunting as I call it. I also go through spells where I coupon a lot and then I get bored with it or even sometimes overwhelmed. So I take a break for a little while but that usually results in higher grocery bills. I use to do monthly cooking when my kids where small but I have not done it in years. Thanks to you I am back on the band wagon. This week I spent $20 for 2 weeks worth of meals so although I used only a few coupons I still was thrilled with how little I spent. Jen: I loved your video…do you have any other “ziploc” freezer 4 in 4 meal recipes? I wish I could spend all day browsing everything on your blog, but certainly don’t have that kind of time. I’m always afraid to make Crockpot meals when I am not hope to supervise them…but would love to try some. Great video! Our freezer and crockpot are perhaps the two most important tools for our frugal grocery budget. About once a month we buy chicken when it hits rock bottom ($1.49/lb) and freeze enough to last us for about 4 weeks. 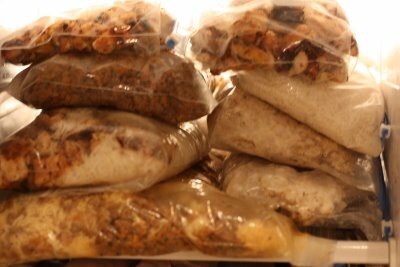 I buy a month’s worth of super-delicious and healthy whole grain bread when I can find it at the dollar store and freeze it. This strategy not only ensures that we’re eating healthy food bought at it’s lowest price, but it drastically reduces the number of times I have to make trips to the store, and also reduces the likelihood that we end up eating out (or eating junk) because we don’t have staple items on hand. I liked your video so much I posted the link on SparkPeople on The Crock Pot Team. Also, just want to say yes it DOES work for singles, I am single but I buy in bulk and batch cook in a large crock pot, all the time. No way would I take the time to make dinner from scratch every night – this speeds things up considerably. Thanks Jen! I’ve learned something new. I’m always ready for quick and easy meal ideas. Jen, that video was how I was introduced to your blog way back when. It was fun to watch again. The main thing I do to get meals on the table quickly is always having cooked ground beef and cooked shredded chicken in the freezer. Then I can throw together a soup or pasta dish pretty quick. Thanks for these tips. While I have done OAMC for many years, I never have put the water in the bags. I am helping my daughter learn how to do this to save time and these are great tips that I will share! Jen, love this! I throw marinades in with my meats so they are ready to be grilled, but this is a new twist! Can you type up these “recipes” and any others like them you have and post them for us? These ideas will be so helpful when it gets a little to dark and cold to grill easily. Why have I never thought of this? Jen, you are brilliant. I met you at Blissdom this year (mutual friend of Traci H. and Cyndi S.). I love your blog and your awesome tips!